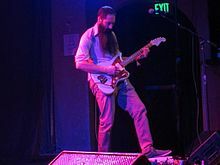 Zac Holtzman is an American guitarist and co-founder of the band Dengue Fever. From 1989-2000 Holtzman was guitarist, co-vocalist, and co-songwriter for the group Dieselhed, a San Francisco-based rock band. Holtzman formed Dengue Fever in 2001 with his brother, Ethan Holtzman. In the 1990s Ethan became interested in Cambodian pop and rock through the compilation album Cambodian Rocks and eventually visited the country, returning with several cassette tapes he purchased there. Some time later, Ethan heard Zac listening to the same music and had an idea for a band based on the psychedelic, surf, garage rock and pop of pre-Khmer Rouge Cambodia. Holtzman plays Luther "Dr. San" Sanchez on the Adult Swim comedy web series On Cinema starring Tim Heidecker and Gregg Turkington. ^ Prato, Greg. "Dieselhed". AllMusic. ^ Novak, David (Fall 2011). "The Sublime Frequencies of New Old Media" (PDF). Public Culture. 23 (3). doi:10.1215/08992363-1336435. ^ Presti, Anthony (28 January 2013). "Q&A: Chhom Nimol and Zac Holtzman of Dengue Fever". SF Station. ^ Kiloglu, Darlene (5 January 2012). "Interview with Zac Holtzman of Dengue Fever". LA Music Blog. ^ Good, Dave (26 April 2011). "Dengue Fever's Zac Holtzman on Their Latest Set, 'Cannibal Courtship'". OC Weekly. This page was last edited on 9 August 2018, at 14:54 (UTC).